What a FAST day! We traveled to see my mother in law for her birthday. Her birthday is the day after mine. And no, Stephen has never gotten them confused. First stop was lunch after church. We tried the Shrimp Basket in Tuscaloosa. I wanted somehting simple that was gluten-free. That counted out ANYTHING within distance of fried food. 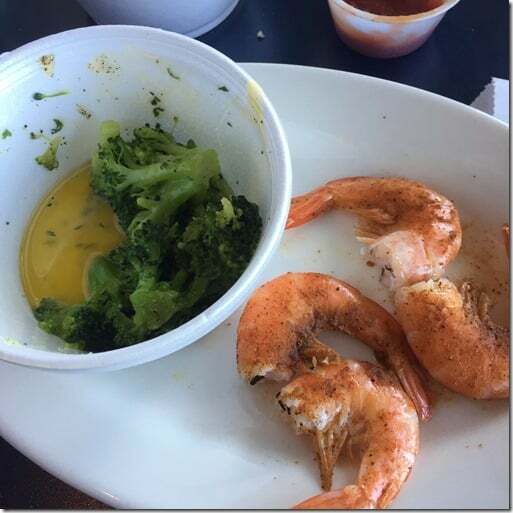 I settled on steamed shrimp. Since they were still in their shell, less chance of gluten cross-contamination. I ordered steamed broccoli to liven up the plate a little. The little bowl of melted butter for my shrimp went right over the broccoli. I had a pile of cocktail sauce for my shrimp. It was glorious! We had a great visit with her. We talked about family memories, people who have moved on from town or life, upcoming family events. Next up, we went by Home Depot for a drill bit. I zipped through the paint to grab more samples. We are now making a loft instead of an attic, so that means more colors. The entire house is whites, greys, blues, greens. Neither of us want anything resembling brown, orange, or red (flooring is red-shaded so entire house will have a reddish floor). What I find interesting is I’m making these stops to Home Depot and Lowes to choose paint strips. I’ve make 5=6 already. I’m picking the exact same colors each time. And I really do spend a few minutes analyzing light. I have always had sharp eye for color and it was very obvious in our previous house when I matched a blue scarf I saw in a magazine 6 weeks earlier. Stephen STILL wants that color for the bedroom. I color matched EXACTLY my kitchen from a picture in a magazine. However, I have never worked with grey. Grey can go so bad with light. Grey to lavender is a real fear I have. I do not want lavender in my kitchen. 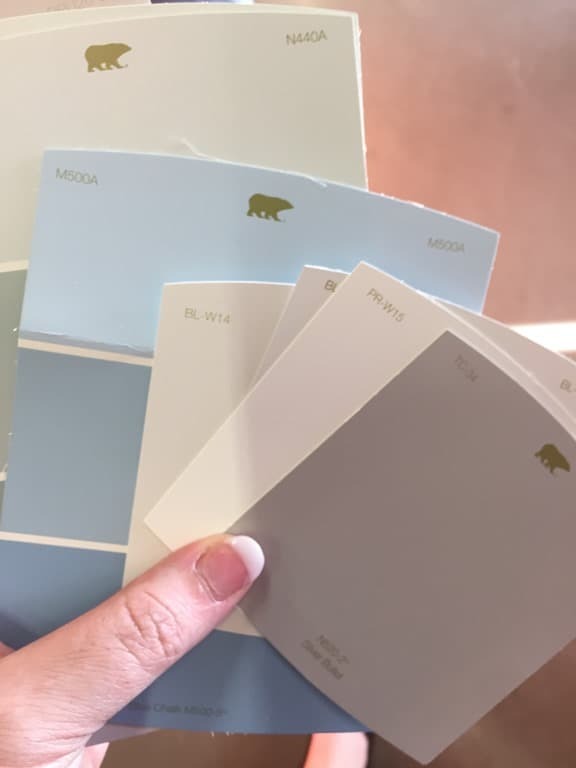 For that matter, I do not want a blue white or a yellow white. I want a very neutral white. I see way too many yellows in “white” and blues in “white”. We came back in time to eat with some friends at Jalapeno’s. 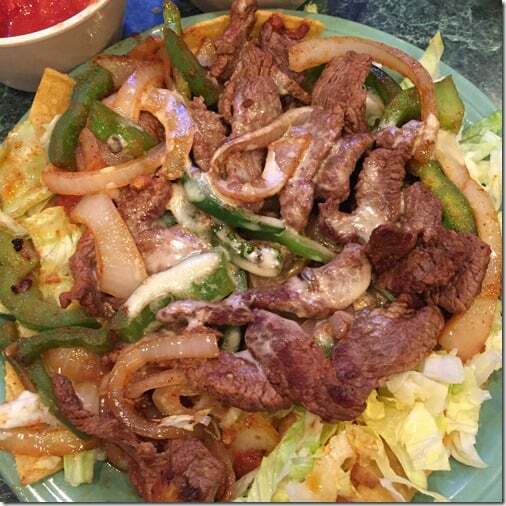 Fajita salad is always on my list. They pour extra cheese on it for me. They have a Paleo menu, as well. There are 4 CrossFit gyms within 15 minutes of each other. Jalapeno’s knew what they were doing with providing a Paleo menu with things cooked in butter instead of sunflower oil and making sure it is gluten-free. It was a long eventful day and great way to end spring break! 9 weeks of school left. How is that possible? ?